PHUKET: A robber was arrested at his rented room in Thalang yesterday evening, 14 hours after he held up two cashiers at a 7-Eleven near the Heroines’ Monument and stole all the cash from the store’s register. Capt Kraisorn Boonprasob of Thalang Police provided details of the incident which occurred early yesterday morning. “Baragis Yamdibu, 24, and Ronpirun Chujai, 32, were working the night shift at the branch. 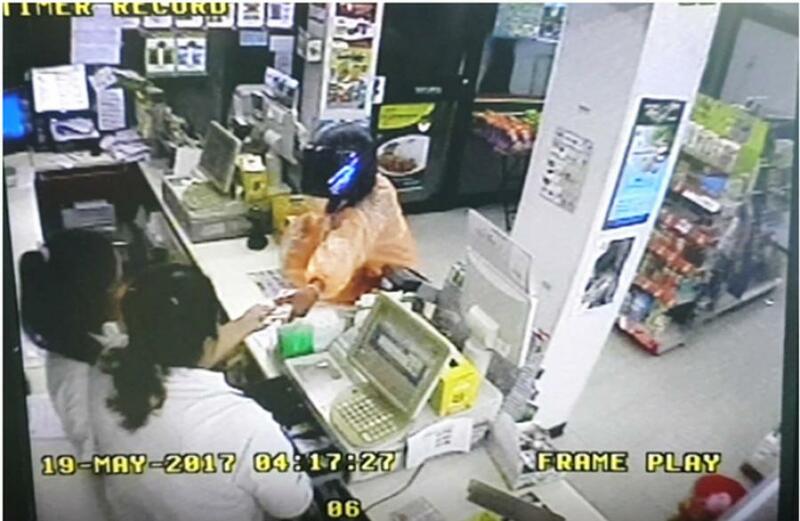 There were no customers in the store when a man in black trousers, orange raincoat and black helmet entered the premises at 4:17am. He pointed a shotgun at the cashiers and threatened to shoot them if they did not hand over the money from the register,” said Capt Kraisorn. “They told him that the register wouldn’t open unless he made a purchase. So, he grabbed a loaf of bread and asked them to enter it as a sale,” said Capt Kraisorn. The man’s face was hidden under a helmet, but his accent sounded southern, Ms Baragis and Ms Ronpirun said in their statements to police. “Once the machine was opened, they gave him all the money in the till, which was 4,100 baht. He then quickly ran out of the shop,” Capt Kraisorn added. Witnesses outside the store told police that the man ran into the fresh market about 50 meters away from the store. Police later found his raincoat and helmet dumped behind there. The suspect was captured at 5pm yesterday. Thalang Police tracked him down using CCTV footage from cameras in the area, which showed him going back to his rented room about 2km from the store on Thepkrasatrri Road. “The suspect, Kumafaisol Kuborsu, 25, from Pattani, was caught with only 2,000 baht in his possession. He told us that he had already spent the rest,” said Thalang Police Chief Col Sompong Thiparpakul. Mr Kumafaisol had previously served a sentence for drugs in 2011. He had also recently been fired from his last job as a security guard at a company in Patong for repeatedly showing up late. “He confessed to the robbery, adding that he desperately needed the money because he had no source of income. He was charged with robbery,” said Col Sompong.